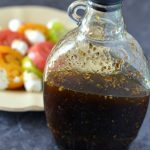 Homemade Italian Balsamic Vinaigrette! This is a great salad dressing and easy to whip up. Mix ingredients and put in container of your choice.